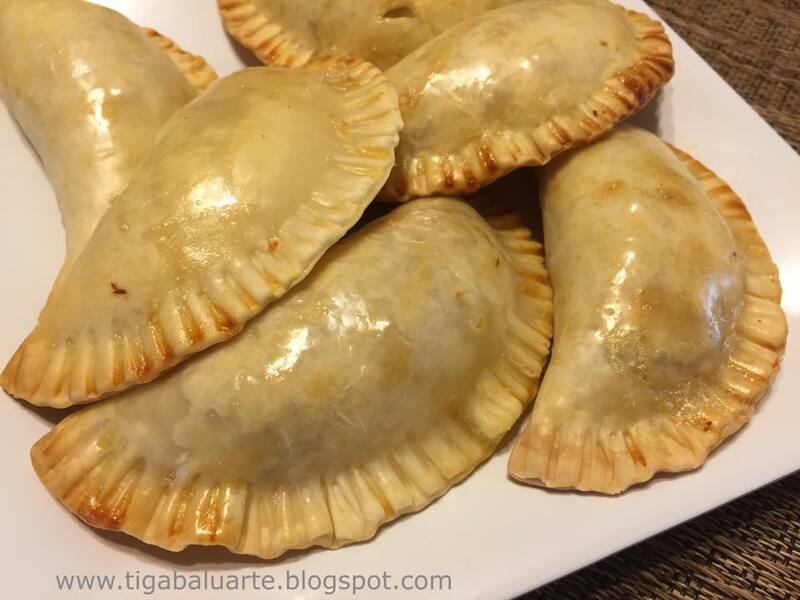 Empanada is a Spanish word meaning meat pie. It is a pastry filled with meat and vegetables and baked. Some do deep fry but I always liked it baked. Instead of chicken you can use ground beef or pork or even fruits. You can also add other vegetables like bell peppers and green peas. See recipe below. Saute garlic and onion in cooking oil until golden brown. Add shredded chicken and stir for a minute. Add carrots, potatoes, chicken broth and cook in medium high heat for 5 minutes. Add raisins, salt and ground pepper. Cook for 2 minutes. Remove from heat, set aside and allow to cool. Add butter cut into cubes. Using a fork, break up the butter into the flour mixture until fully mixed. Add water and egg. Mix until soft dough is formed. Line baking sheet with parliament paper. Scoop a tablespoon full of dough and form into a ball. Flatten using a rolling pin. Place a tablespoon of the chicken filling in the center of the dough and a piece of the hard boiled egg. Seal by folding and pressing the edge with the fork. 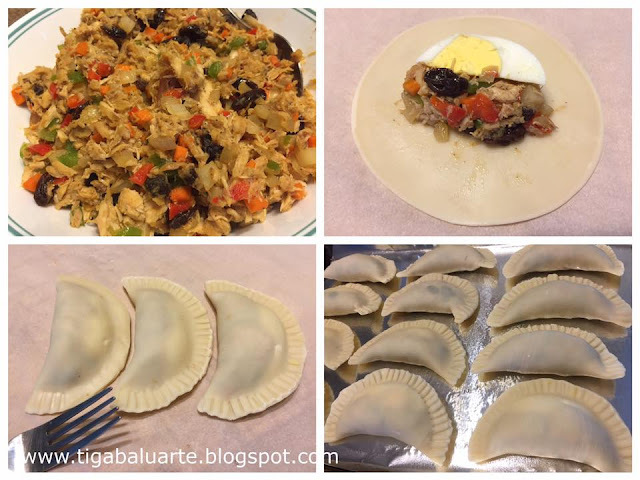 Arrange empanadas on the pan and brush with egg wash. Remove from the oven and serve with your favorite beverage. Enjoy. Thank you for sharing the recipe ... I was checking your ingredients to see if your filling had any thickening agent ie corn starch, flour etc to keep the filling together .... this is when I noticed that your listed ingredients had listed carrots 2X ... one of which should be potatoes (following through your procedural steps). Your recipes are easy enough to follow for cooking neophytes like me. Thanks & best regards. thanks for catching. changes done.